As you all know, we have a long weekend on June 2/3/4/5 2012 when the Queens Diamond Jubilee will be celebrated. Weedon Bec are going to be celebrating this event. A first meeting was held on 30th November to bring together representatives from lots of village groups and interested residents who are hoping to get something off the ground for us, as a village, to celebrate this weekend. Since then the Working Group formed from various representatives of groups in the village have been working behind the scenes to organise this event. We hope as a Weedon Resident you will find time to come and get involved for this memorable occasion. What is happening during the weekend ! 10.15 am - the Grand Parade assembles in Fireworld (the Depot). Led by the Nene Valley Pipers, the parade will start at 11 am, go through the village ending at the Croft Way Playing field with Fancy Dress judging & presentation of prizes. A break for refreshments will be held on Oak Way.All welcome in fancy dress - Kings and Queens and/or Red, White and Blue. 2 pm to 4pm – Street Party on West Street with Children's entertainment. All welcome – bring some food for your family and enjoy the entertainment. Massive pass the parcel, Lovely the Clown with her amazing balloon modelling, face painting etc. Call Judith on 349613 to book a table. History Society Display entitled "The Queen and Prince Visit Weedon" open in the Village Hall Annexe 2-4 pm. The display relates to the visit by Queen Victoria to Weedon. The updated albums of historical pictures will also be on display. 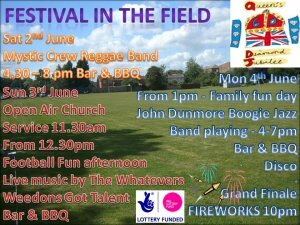 4.30pm to 8 pm - Relax and enjoy the start of our Festival in the Field at the Jubilee Field with a great reggae band Mystic Crew, BBQ and bar. 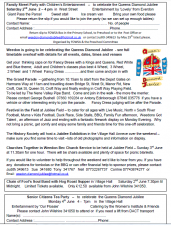 7.30 pm to midnight – Chain of Fools and hog roast at the Village Hall. Ticketed event! Call John Wilshire on 341050 for your ticket. Tickets going fast! 11.30 am – Open Air Church Service at the Jubilee Field, organised by Churches Together in Weedon Bec. Come to give joyful thanks and praise in this Diamond Jubilee year. & sing some of your favourite hymns! All welcome. Mums vs Kids match, Penalty Shoot outs, North vs South of the river game, tombola, cake stall, side stalls, duck race, BBQ and Bar! History Society Display entitled "The Queen and Prince Visit Weedon" open in the Village Hall Annexe 2-4 pm. The display relates to the visit by Queen Victoria to Weedon. The updated albums of historical pictures will also be on display. The Brownies will be providing Tea and Cakes at the display during Sunday afternoon opening. 4.30 pm through until 10.30pm – Festival in the Field. The music continues with a disco, great live band "The Whatevers" and the unmissable spectacular of the first heats for Weedon's Got Talent. Have you got a talent you want to share – come on down! BBQ, Bar and lots of great fun – Don't miss it! 11 am – Barrel Rolling in West Street. The Maltsters and the Plume are arranging some traditional barrel rolling on West Street – come and join in or just have a laugh watching! 1 pm - Dedication of the Jubilee Field as a Queen Elizabeth II Field in Trust. Dedication led by Gina Ogden. History Society Display entitled "The Queen and Prince Visit Weedon" open in the Village Hall Annexe 2-5 pm. The display relates to the visit by Queen Victoria to Weedon. There will be Jazz from the John Dunmore Boogie Band between 4 – 7pm, followed by the final of Weedon's Got Talent, and a disco until 10 pm. Bring a picnic and relax in the field. BBQ and Bar. 4pm to 7pm – the Senior Citizens Tea Party will be taking place in the Village Hall. Contact John Wilshire on 341050 to attend. The Jubilee Parade with a Red White and Blue theme will start from the Depot entrance at 11.00am and travel round the village: Harmans Way, Bridge Street, West Street, Manor Road, New Croft, Oak Street loop, Queen Street, Croft Way, West Street to the Village Hall. A Pipe Band will lead the way, vehicles from FIREWORLD are joining along with some old motorbikes and cars. If you want to take part on foot, in a pram, with a vehicle or some other wheels DO get in touch - why not join the parade in your Fancy Dress ??? For Wheeled classes: 4 Wheels 3 Wheels 2 Wheels 1 Wheel !!! iIt will be in West Street near the School. You will need to bring along your own food - just like they did in the 1950's and maybe even a chair! We'll put out some tables!! To Celebrate the Queen's Diamond Jubilee, Weedon Football Club will be holding a match on Sunday 3rd June, Kick off 2.30pm, at the Jubilee field, between residents and former residents of Weedon. The teams will be split into two; depending on whether the participants live/lived North or South of the River Nene. The game is open to all residents and former residents of the Village from the age of 16+ and it doesn't matter if you have played 100's of games of football or none! Everybody who wants to play, can. If you are interested in playing please contact Danny Chapman on Weedon.fc@hotmail.co.uk or 07840842841. Riverside Drive, Priel Road, Little Priel Road, Crosse Close, Eton Close, Gloucester Close, York Ride, Lancers Way, Equestrian Way, The Greys, Regency Close, Windsor Close, Cavalry Hill, Campbell Close, Cavalry Fields, Fusiller Way, High Street, Watling Street and Bridge Street from the Jubilee Field North. West Street, West Way, Neneside, Brookside, Croft Way, Kings Park, Queens Park, Queens Street, Oak Street, Oaklands, Holm Close, Tithe Road, Dukelands, Princes Close, New Croft, Martyns Way, St. Peters Way, Manor Road, St Mary's Way, Orchard Close, Buswell Close, Church Street, Billing School Place, New Street, South Street, Farthingstone Road, Holm Close, Home Farm Close & Bridge Street from the Jubilee Field South. Organised by the Brownies. Ideal for taking a Family stroll round the village. Starting from Jubilee Field. Prize for the winning team. 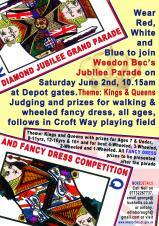 weedon-diamond-jubilee@hotmail.co.uk before 28th May to register your place. The Flyer had a slip to complete area more information about the weekend ! will present 'The Queen and Prince visit Weedon' and this will be a series of panels with pictures and text relating to Queen Victoria and the Prince visiting Weedon. In addition the albums of old pics will be there to see with a few updates of pics received since the last time they were on show. Take time out to have a walk up to look at the exhibition - we are all looking forward to it. Thanks go out to the History Society for offering to get involved and come forward with this new exhibition. All our wonderful commemorative mugs have now been sold. They had a great hand drawn design and will provide a lasting reminder (until you drop it on the floor and break it!!) to mark this occasion.